Learn vocabulary, phrases and sentences at your own pace. Learn efficiently. Your lessons will adapt automatically depending on your personal progress. Save your lessons as MP3 audio and MP4 video files for on-the-go learning and rapid progress. Each time you save a file, it will update automatically, adding new material and removing material you already know. Practice your lessons using your smartphone, tablet or portable media player. Hear your own recorded voice and compare it with a native speaker’s voice. Save and track your progress. Practice reading and writing; spelling is corrected automatically. Memorise more effectively. Vocabulary includes associated images. Set custom options depending on your own learning style. Languistik supports a wide range of languages. Windows 7, Windows 8.1, Windows 10 or Mac OS X 10.10 or higher. Multimedia computer with support for audio playback and recording. Headset recommended. Minimum of 10 GB hard disk space recommended for the installation of the programme and language content. More space may be required for the storage of recorded MP3 audio and MP4 video files. 4 GB RAM or more recommended. 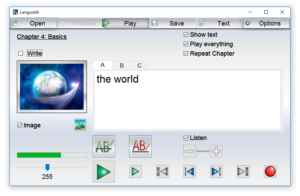 For MP3 audio playback, virtually any MP3 player or playback device such as a smartphone, iPod, computer, etc. For MP4 video playback, a compatible MP4 player or playback device. Note that video files created by Languistik are highly compressed to reduce file size, and can include subtitles and images. Because this is an advanced video format, legacy video players may not support playback.